It’s a 4-day weekend! I took Friday off work since the kids’ school had a budget closure, thinking we could enjoy a 4-day weekend someplace (I create my closure calendar in November of the previous year)….well, no such luck on finding a place to go this weekend. I still kept my day off…. I needed the break! I planned on no house cleaning or anything daycare related for all 4 days (well, until 3pm Sunday at least). Thursday night after work I spent most of my time sorting/organizing/filing all our digital photographs for 2013. I wanted to make sure we had all our camera cards completely cleared and emptied and that everything was loaded into my laptop and organized. That took about 2.5 hours, surprisingly. When I finished that we all gathered on the couch to watch the Grimm season finale as a family and then it was off to bed. The kids had built forts in the playroom and slept there (actually, they slept there ALL weekend and we didn’t take the forts down until Monday afternoon!). Each kiddo had their own fort- and basically used every blanket and chair in our house! Friday Jim worked, I slept in until about 6:30, then decided I was going to spend my morning in bed. I made my coffee and turned on the TV and decided I’d get caught up on my DVR’d shows since I haven’t had any opportunity this week (not even during quiet time!) to watch ANY TV. Four episodes of “Revolution” later, (getting snuggle time with Trevor, too!) it was 10:30 and I decided it was time to get up and take my shower! I spent the following hour organizing the 2012 photos that were never done, then it was time to head out for my doctor appointment and afternoon of shopping with riley. First up, the doctor appointment…. They took xrays of my left foot in various positions and long story short, no former fracture, I just have the beginning of a bunion. I always thought a bunion was a big protruding bump on the side of your foot, but instead I learned that a bunion is actually a “hallux abducto valgus deformity” where the bones connected to your big toe are simply out of alignment with the rest of your toes. 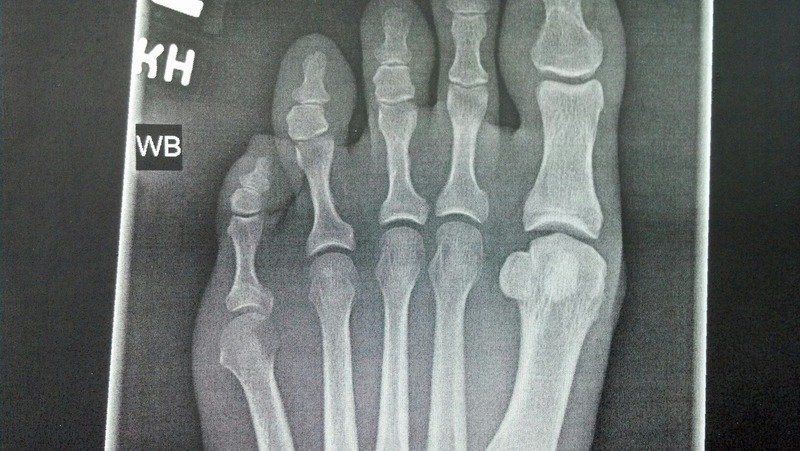 After reviewing the xray the doctor was surprised I’m not having any pain at my pinky-toe area since those bones are really out of alignment and look like they are rubbing. The only pain I have is between my big toe and second toe and it’s not all the time, just after a lot of activity or heavy walking or running around barefoot or in flip flops for too long. He said the pain I feel is from the joint becoming inflamed due to rubbing because of the misalignment. He said it’ll never get better, but could likely just stay as-is (or get worse) and that I just need to keep doing whatever it is that I do that seems to help alleviate symptoms when they appear (which is typically ibuprofen, ice, and wearing my heels or wedges). I was expecting to hear about how wearing heels or wedges are BAD, but instead he said that my stiff soled shoes are the perfect choice for alleviating the pain because that style of shoe takes all the pressure off my toe joint since the sole isn’t flexible. He also said to prevent flare-ups I should wear shoes as much as possible and limit my barefoot time (um, hard to do when I’m home all day). Did you know there’s little “kneecaps” on the bottom of your big toe joint as well? That’s what those two little round bones are- sesamoid bones! After the appointment we did our shopping, a quick stop at the Dollar Tree to pick up plain notecards (jumbo sized) and journals for the kids to use at Disneyland. A stop at AAA to pick up Disneyland tickets (yippee!! ), lunch at McDonalds where Riley ate her first ever Big Mac and loved it (I had a free coupon for one), then it was off to Old Navy to stock up on summer shorts and tanktops. Riley had NO shorts (except athletic shorts), and I could always use new tanktops to replace my dingy stretched out and/or shrunk ones. We had a good afternoon together, wish we had more time to do ‘date afternoons’ more often with my kids! Anyway, after that project was done I did some barkdust prep, helping to pull out renegade bamboo shoots, pulling ground cover from our neighbor’s yard that has encroached heavily into our yard, and when Jim left to get the barkdust I came inside to type this. It’s 11:30 am. Can I be done yet? The second trick – I ran two sprinkler lines to the pan so that it would be refilled whenever the sprinklers ran. Unfortunately it was overkill so we capped one line and left the other and as long as the fountain runs full time, it can accommodate the 6 minutes of watering every day. If the fountain isn’t on, then it’s too much. So not a perfect solution, but better than dragging the hose out every day! We didn’t finish barkdusting until almost 3:00 (including clean up). Ugh. I worked entirely too hard! Again. As usual. For the record, we were able to use just 2 yards! YAY! We have hardly any barkdust areas in the backyard, it’s all in the front yard, and not much at that! When we were spreading barkdust I made a comment that a small retaining wall would look cute around the clematis and iron arbors, and we could keep the neighbor’s ground cover under control- always spraying anything outside of that retaining wall. Jim agreed, and we knew it would be a fast project, so decided I could do that Sunday morning if the weather was still nice. Quitting time was around 4:30, we spent the rest of the evening relaxing with the Boggs family in our backyard. The girls all had fun playing together, we’ll definitely need to get together more often! Sunday morning Jim and I discussed our agenda for the day as we enjoyed a lazy morning. At 10:30AM I took Riley with me to Lowe’s to pick up retaining wall blocks and fence boards for one of Jim’s projects. There sure are a lot of options for retaining wall stones! Holy cow! I wanted something a little more “natural” and stone looking, not so concrete looking, and ended up purchasing these (and it all was loaded into the BMW trunk- lol!). Any opportunity to save fuel, we take the red car….even if it’s not the most logical vehicle to take sometimes (ie trips to Costco or Lowe’s or to pick up hanging baskets! ha!) because 24mpg sure beats 15! I wish I would have taken some before pictures. Oh well. It took me about 2 hours. Riley helped me with the project- it was nice to have the company even thought it’s mostly a one person job, but I enjoyed teaching her the steps and she seemed to enjoy helping me as well. We are also considering doing the same around the bamboo trees, just to beautify the area a little better. Maybe not with the exact same stuff, but we should do something. Here’s the after- still needs something extra to jazz it up, but at least it’s not an ugly power box anymore! Clean up time was around 2:00, then Jim and I headed out for a date day of shopping, trying to get some things ready for our Disneyland trip. We also picked up a couple of hanging baskets from Bob’s Garden Center on TV Highway. Came home, then at 5:30 we headed out the door for an evening at Big Al’s to visit with Jim’s mom who is staying with Jim’s sister for the week. Sunday was a lazy day. Well, sort of. Jim worked on the utility trailer (it’s parked in our garage so he can work on it in rainy weather- Nikita ate all the wiring last year!). Meanwhile I ironed clothes, finished this blog, worked on packing, and gave the girls pedicures. The other part of our shopping trip was to find two particular snacks that the kids have requested for our vacation…. Um, can’t find either of those. We’ve tried Cash ‘n’ Carry, Target, Bi-Mart and Fred Meyer. We found something “close” but not exact. Who woulda thunk those would be difficult to find? Costco is our last shot for those peanut butter chocolate wafer bars- I remember they had them years ago. Time flies, though. Anyway, that wraps up our 4-day weekend. It sure doesn’t feel like it was 4 days off work. And it certainly wasn’t relaxing. And my back and legs are killing me from all the physical work with the barkdust and digging and raking and carrying stones and, and, and. Next Next post: Look Who’s in High School Now!